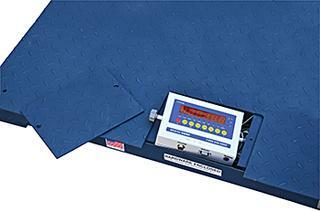 This scale has a low profile, allowing easy loading and unloading of heavy equipment. The rugged design has a tread plate top surface. The digital display stand is adjustable to 42" high and powered by (4) four C cell batteries (included) or 115V, 1 phase AC power, cord included. Optional Approach Ramp for pallet truck accessibility — order two for drive-on, drive-off convenience. NOTE: Customer is responsible for contacting the local Weights and Measures Department or a state certified scale dealer before putting Legal for Trade (NTEP) scale into service for certification and is responsible for re-certification as required by local codes by certified personnel. Transfer equipment – even oversize loads – onto your scale with ease. Order two for drive-on, drive-off convenience. Colors may vary. Provides a non-slip grip with the tread plate-style surface. Handles the heaviest loads with the high design.